FEMA’s Risk Mapping, Assessment, and Planning (RiskMAP) Program’s vision is to provide quality data that increases public awareness and leads to action that reduces risk to life and property. The New Mexico Department of Homeland Security (NMDHSEM) and Earth Data Analysis Center are working with FEMA Region VI as Cooperating Technical Partners through RiskMAP to prioritize flood related data needs throughout the state. NMDSHEM and EDAC operate the nmflood.org website that hosts interactive maps, current flood related news, and links to online flooding tools and are active in the New Mexico Floodplain Managers Association and New Mexico Silver Jackets. EDAC attended the NM Department of Health kick-off for New Mexico’s Environmental Public Health Tracking (EPHT) Program in 2002, and has participated in the NM EPHT Program in the years since. New Mexico is an original Grantee in the Centers for Disease Control and Prevention (CDC) National Environmental Public Health Tracking Program and is currently one of 24 EPHT Grantees. This CDC program provides state health departments with resources to create statewide networks that integrate data sets, tools, and standards, thus allowing the state network to be an interoperable component of the National EPHT Network. New Mexico supports the national EPHT goals to prevent or reduce illnesses, injury, and death related to environmental risk factors and to increase the understanding of the relationships between environmental exposures and health effects. EDAC develops, implements, and enhances the NM EPHT Network/System (NM Tracking) nmtracking.org and its relevant data services. NM Tracking consists of a content management system for text- and graphics-based information and an interactive, dynamic data analysis, visualization, and reporting application. The portal provides a secured, publicly accessible, Web-based mechanism to exchange data and information between data stewards, analysts, and New Mexicans and the public; to discover and view data; and to explore relationships between environmental exposures and potential health outcomes. 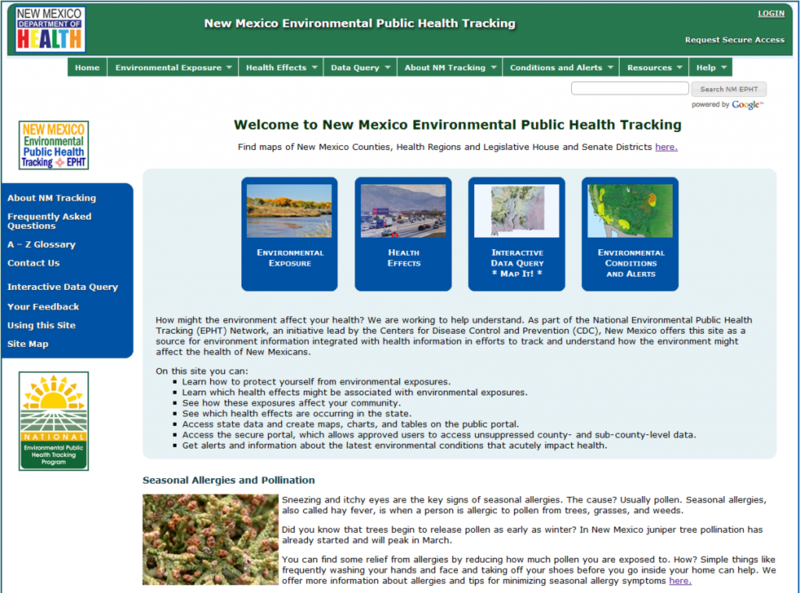 To achieve this, NM Tracking uses an on-line data registry to make environmental public health information, data, and standardized metadata available for query, visualization, download, and report generation. Data security is ensured through secure Internet transmissions, encrypted messaging, and authenticated and authorized user roles in all communications between NM Tracking and the NMDOH environmental-health-data provider NM-IBIS and other distributed data providers. The “New Mexico Watch – Active Wildfires” (nmwatch.org) is a public website developed and hosted by the Earth Data Analysis Center that provides information about active wildfires in the state of New Mexico. NMWatch integrates local data (public schools, hospitals, fire stations, law enforcement, community centers, watershed boundaries) with active wildfire perimeter and location information generated daily by the Geospatial Multi-Agency Coordination Group (GeoMAC). 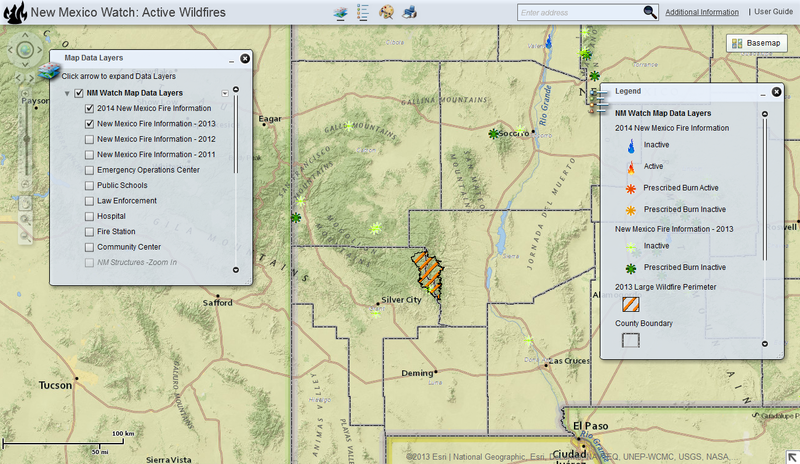 Local fire information is added as available from NM Fire Info (New Mexico Fire Information). Users can measure distance and calculate area using built-in tools. The New Mexico Broadband Program (NMBB) is part of the National Telecommunications and Information Administration (NTIA) State Broadband Initiative (SBI), which implements the joint purposes of the American Recovery and Reinvestment Act of 2009 and the Broadband Data Improvement Act. The SBI program facilitates integration of broadband and information technology into state and local economies. EDAC, in partnership with the NM Department of Information Technology (DoIT), developed a Web map for the New Mexico Broadband Program. 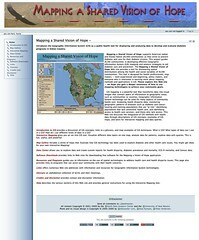 The NMBB Map, http://nmbbmapping.org/mapping/, is an interactive map built on ESRI’s ArcGIS Server API for Flex. 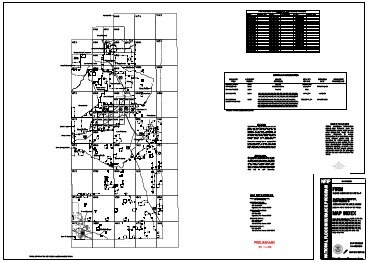 The map displays all wire-line and wireless broadband services available in the State of New Mexico, based on the type of technology reported in data collected from Internet Service Providers (ISPs) and other sources. Collected data are analyzed and processed according to NTIA standards, verified with the ISPs, and submitted to NTIA twice a year. 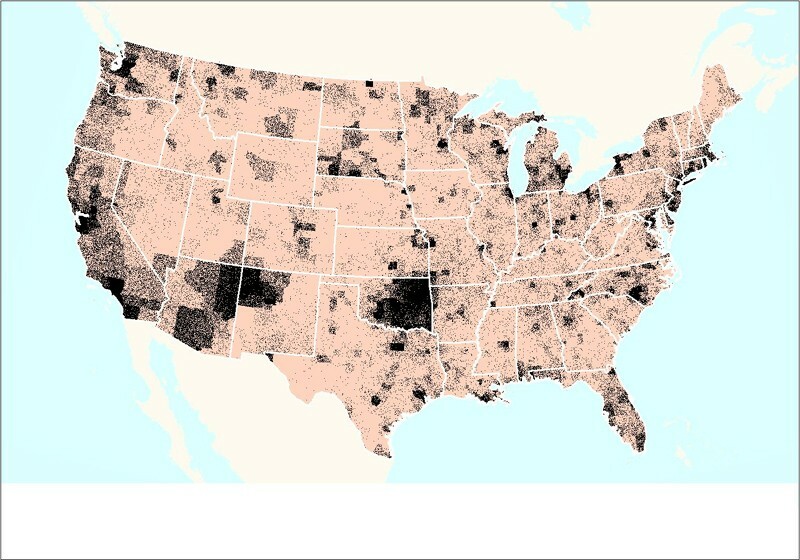 NTIA incorporates the submitted broadband data into the National Broadband Map, and EDAC uses the data to update the NMBB Map. EDAC and NM DoIT plan to improve broadband data quality through crowdsourcing in the next phase of the program. The NM Broadband Map allows consumers to identify the broadband services available in New Mexico, and policy makers to address the barriers for broadband expansion and to improve broadband adoption in under served and non-served communities. The adoption of high-speed Internet services and information technology enhances economic development, public safety, health care, educational opportunities, and the quality of life for New Mexicans. The New Mexico Public Schools Facilities Authority (PSFA) Statewide Web map was developed to communicate information about public schools in the State of New Mexico. The Web Map displays public school information including school enrollment numbers, school capacity calculations, the New Mexico Facilities Database ranking information, and community assets are presented in tabular and graphical formats. The Pre-Disaster Hazard Mitigation Act of 2010 (PDM), administered by the Federal Emergency Management Agency (FEMA), provides funding and technical assistance to state and local governments for disaster preparedness and management. Over the last two years, UNM has developed the first university approved Natural Hazard Pre-Disaster Mitigation Plan in New Mexico. The ongoing program aims to develop ways to reduce impact of natural disasters on UNM’s resources by identifying natural hazards and associated risks applicable to UNM, determining the impacts of these hazards, setting mitigation goals, and developing strategies that would lessen potential impacts. EDAC’s role in the plan is to perform fundamental analysis of top hazards likely to affect UNM by identifying such as thunderstorms, lightning, hail, winter storms, extreme cold/heat, wind/dust storms, tornadoes, flooding, wildfires, drought, and earthquakes and by incorporating factors such as building age, building use, and building function to properly assess the risk associated with various hazards. Through output maps and reports, hazard awareness can be better understood and shared. Priorities then can be established and the mitigation plan implemented. Because universities provide structure and stability to local economies and directly influence their surrounding communities, states, and local governments, having a Pre-Disaster Mitigation Plan that saves lives, reduces damage and monetary loss, and keeps universities’ doors open and fully operational is essential. EDAC, in cooperation with the New Mexico Department of Homeland Security and Emergency Management (DHSEM), continues the partnership among state and Federal agencies, local communities, tribal entities, and professional associations to assess, inventory, acquire, and distribute data that support coordinating, planning, and developing floodplain mapping, as stated in New Mexico’s Map Modernization Management Support (MMMS) business plan. EDAC provides the State with an ongoing coordinated floodplain mapping program. In light of the Flood Map Modernization Mid-Course Adjustment greater focus has been placed on compliance with FEMA’s 2005 Floodplain Boundary Standard, which includes providing access to the most current and accurate digital data layers. 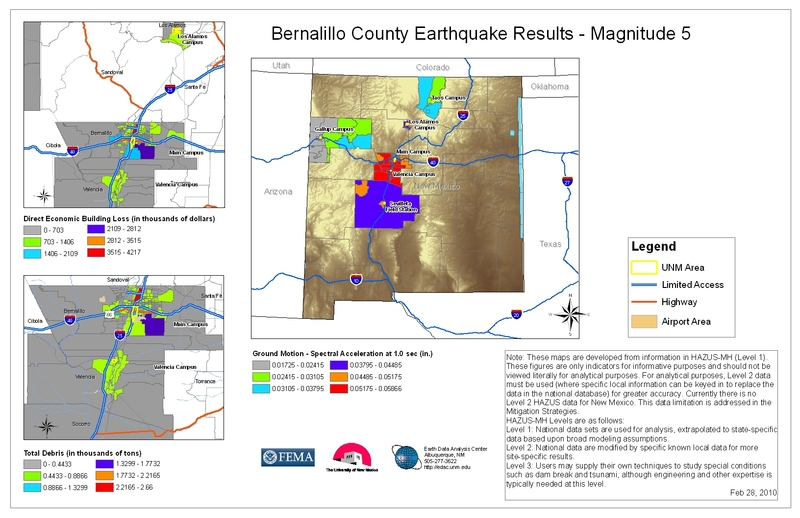 The digital data will be accessible to engineers, local communities, and citizens of New Mexico thus providing officials information required for accurate assessment of risk-based mapping priorities. EDAC worked with the National Diabetes Prevention Center (NDPC), Program Development Branch, National Diabetes Wellness Program, and Center for Disease Control and Prevention (CDC) to assist in serving Native communities. As part of the project we developed a public health tool for displaying, analyzing and mapping diabetes in Indian country. This lead to the development of culturally sensitive educational materials, diabetes mapping tools and other GIS/healthcare related products. 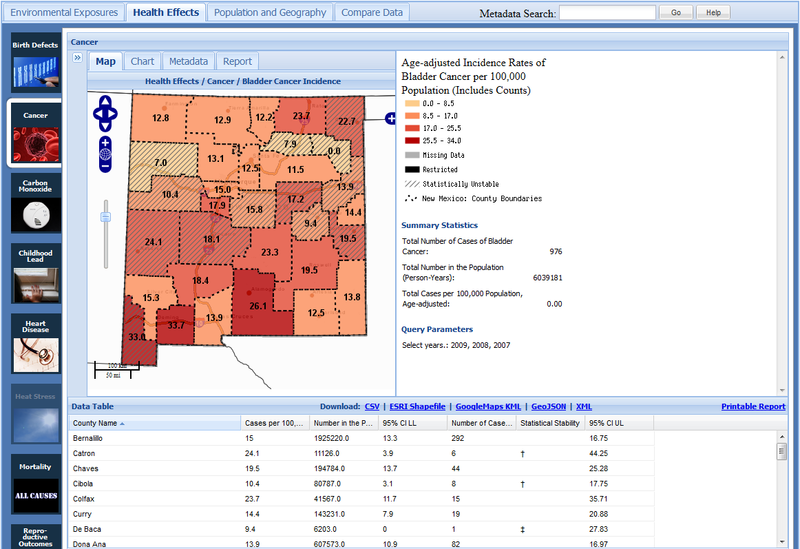 EDAC in cooperation with the National Indian Council on Aging, and sponsored by the Indian Health Services (IHS) through the Indian Elder Care initiative developed an interactive Atlas of Indian Elder Health. The interactive atlas provided query capability to IHS databases and displayed the results as maps at national, regional, or local levels. Health data were overlaid with environmental, socioeconomic, and geopolitical data from the US Bureau of Census, the Environmental Protection Agency and other public domain data sources. While targeting Indian elders, the interactive mapping application contained IHS de-identified data for patients of all ages, making it a valuable national healthcare resource for Indian country. The Atlas highlighted the needs and conditions of this special population while providing tools and methods to better understand elders and elder needs.